On November 6, 2018 we in Virginia will vote for all eleven of our members of the House of Representatives and for one of our Senators. 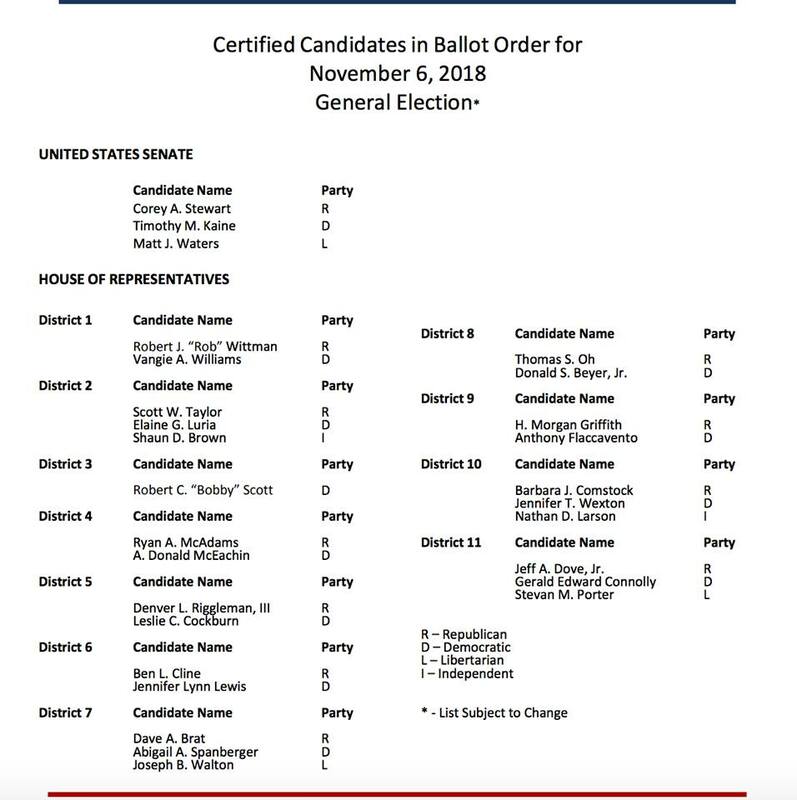 Below you will see the order that names appear on the ballot. This may be a bit confusing as this list shows the candidates in all eleven Congressional districts. On your ballot, you will see ONLY the race for your district. For example, in Congressional District 1, you will see the names of Wittman (R; incumbent) and Williams (D) in the House race, and, Stewart (R), Kaine (D; incumbent) and Waters (L) in the Senate race. Here are some important deadlines. Registration. If you are not registered to vote, the last date you can register for the November election is OCTOBER 15, 2018. Absentee voting. Absentee voting for the Nov 6 election starts on September 28, 2018. Previous PostPrevious Vangie Williams out and about in the First District on the Fourth ! !